Shopping for Green Lantern Statues? Celebrate the introduction of Hal Jordan and the Green Lantern Corps! Limited edition statue depicts cover art from Showcase Comics #22. Statue measures 8 1/2-inches tall and comes individually numbered with certificate of authenticity. 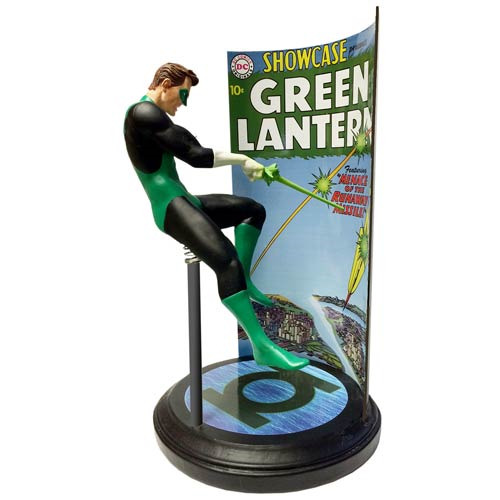 A highly detailed premium motion statue that captures the cover of Showcase Comics #22 and the introduction of Hal Jordan and the Green Lantern Corps! The birth of the Silver Age of Green Lantern. Crafted from heavyweight polystone, the statue hovers in mid-flight as he attempts to arrest the missile's flight. The backdrop is a thick rolled metal, decorated with cover artwork. Each statue is individually numbered and includes a certificate of authenticity. Measures 8 1/2-inches tall! Ages 14 and up.